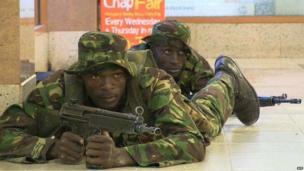 News photographs from the scene of a gun battle at an upmarket shopping centre in the Kenyan capital, Nairobi. 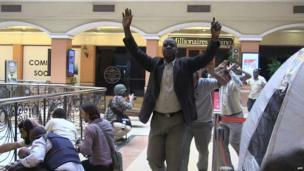 Military activity continued outside Nairobi's Westgate shopping centre late on Monday as the crisis entered its third night. 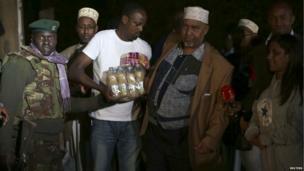 Members of Nairobi's Somali community delivered food and drinks to soldiers and security personnel as darkness fell. 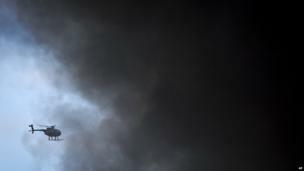 Plumes of black smoke billowed from the mall following large explosions. 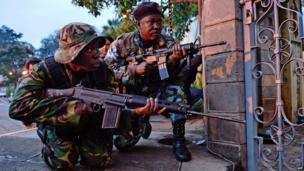 Shooting could be heard throughout Monday as security forces swept the complex for hostages and militants. 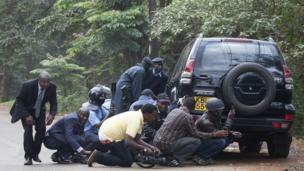 Police officers and members of the media were repeatedly forced to take cover during sporadic bursts of gunfire. 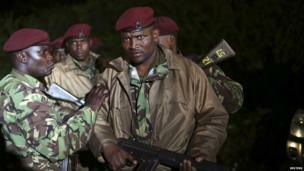 Kenyan security forces surrounded the Westgate mall in Nairobi as dawn broke on Monday. 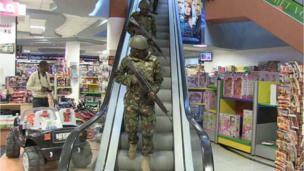 A video from inside the shopping centre showed the army taking up positions on Saturday. 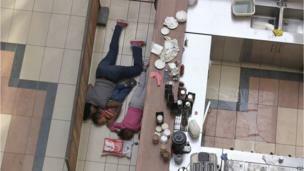 Civilians were still sheltering inside the mall. The death toll from the assault has been put at 62. These shoppers were escorted to safety by security forces. 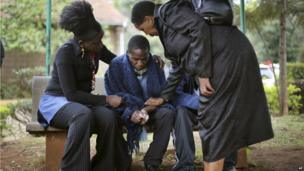 Outside the city morgue, this man took in the news of his father's death. Some of those who were killed have already been buried or cremated, in line with local customs. 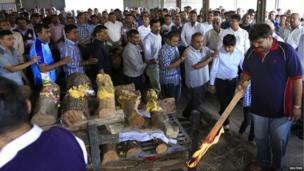 Here the father of 16-year-old Nehal Vekaria lights the funeral pyre for his daughter's cremation. 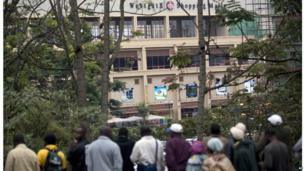 As heavy gunfire was heard on Monday morning, people gathered on a hill near the mall to wait for news. 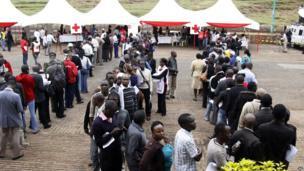 Many Kenyans came forward to donate blood for the large numbers of wounded.